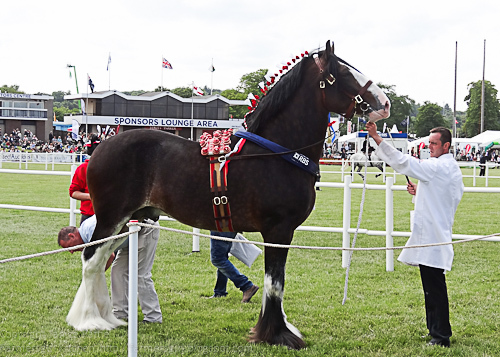 You may remember that I posted about the Royal Highland Show a few weeks ago? Well, the time has come for the 2013 show. It's on from Thursday 20th June to Sunday 22nd June. 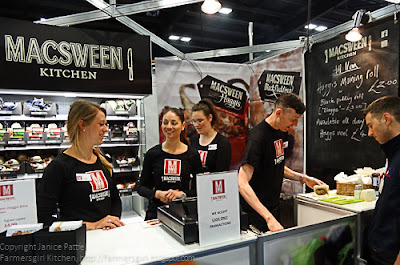 I took a day off work to visit the show with particular emphasis on the Food Hall! 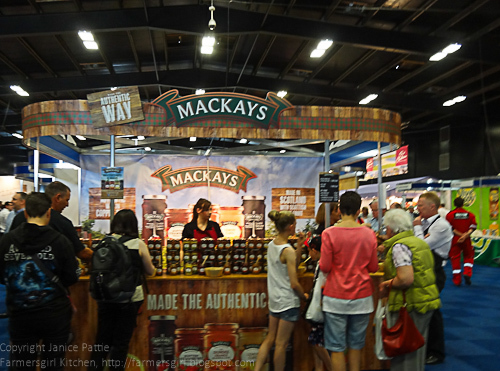 I caught up with the lovely Claire, from Mackay's Jams who I met at the Marmalade Awards last year, I'll be posting some recipes using Mackay's Jams in the very near future. If you are going along be sure to say hello to Claire. And this is the 'Blaggis' Roll (haggis and black pudding) I bought from MacSween for my brunch, kept me going all day. After a scout around the Food Hall, I decided to head out to see some of the livestock before coming back for the Cookery Theatre. 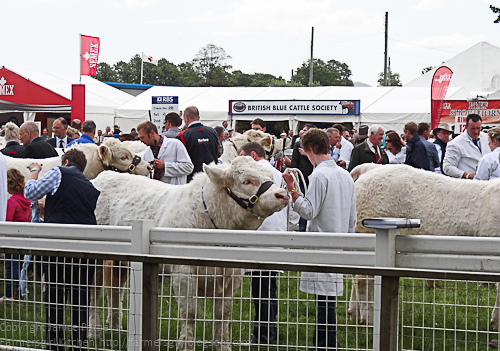 These beautiful white Charolais Bulls were waiting to be judged, they have been brushed and talcumned within an inch of their lives to make them look their best. 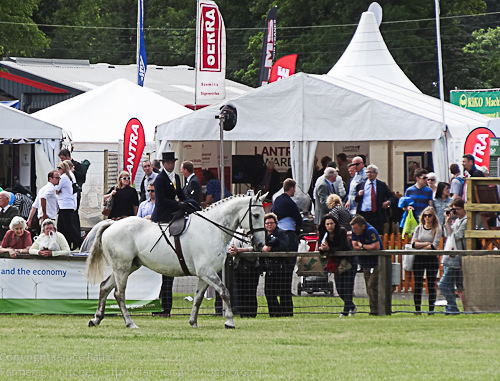 Once in the ring, this one wasn't quite so well behaved! 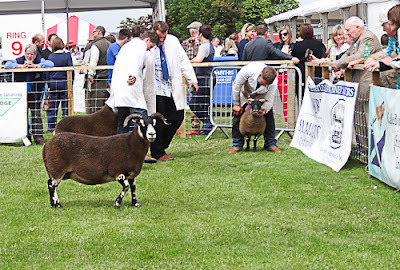 I wasn't quite sure what they were doing here, they seemed to be getting this poor sheep to keep turning round so they could look at both sides, it seemed bemused rather than distressed by it though. The Ladies Hunters were ridden side-saddle. 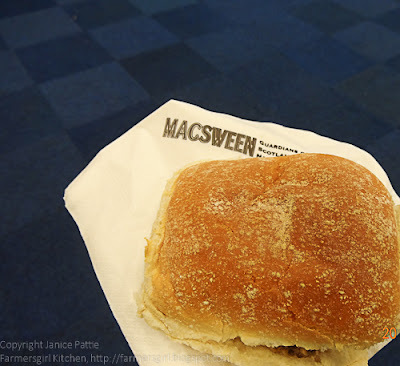 Now I could carry on as I have more livestock photos, but I think I'd better get back to the food! 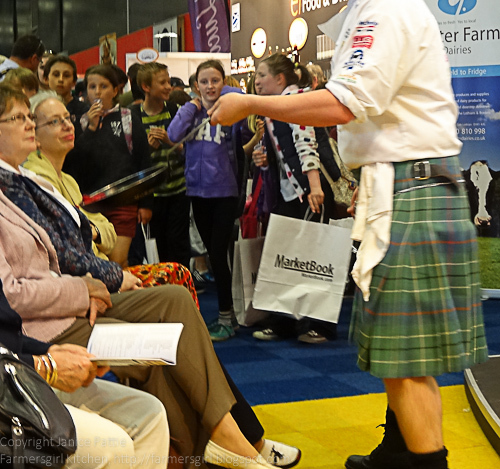 First up in Scotland's Natural Larder Cookery Theatre was Wendy Barrie, a campaigner for local produce. Wendy was a finalist for the Scottish Countryside Alliance Rural Hero Award recognising outstanding personal contributions to country life & communities for her dedicates upport of lcoal produce and her on going achievements. 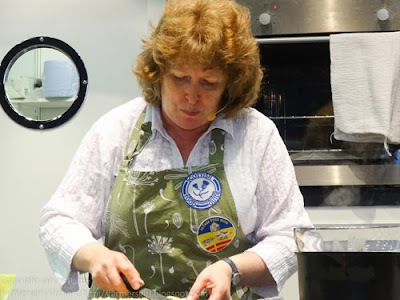 Wendy was cooking up 'A Celebration of East Lothian Food and Drink'. Wendy made some delicious trout skewers, the trout was marinated in lemon juice, honey mustard and honey. 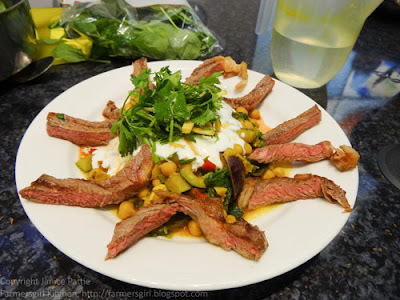 They cooked in the oven in no time and were accompanied by a salad. 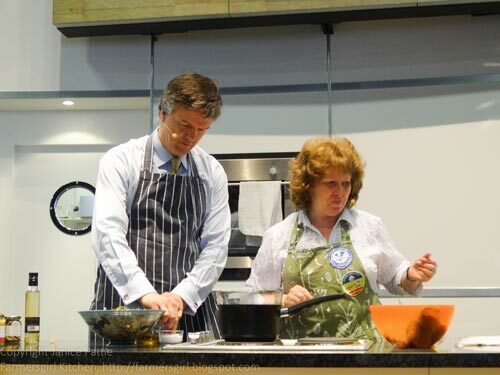 Wendy had some help to make the salad dressing from Michael Moore MP the Secretary of State for Scotland. 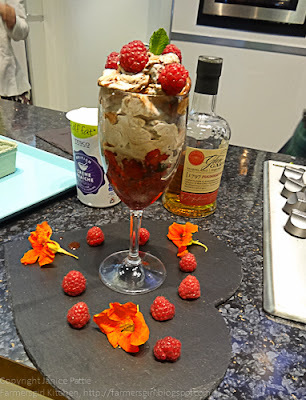 Wendy also made a Chocolate Roulade and a Tea Loaf which was cooked flat as a traybake type thing, which was served with ice cream. Best Tip: Add some cocoa powder to your melted chocolate to intensify the flavour. 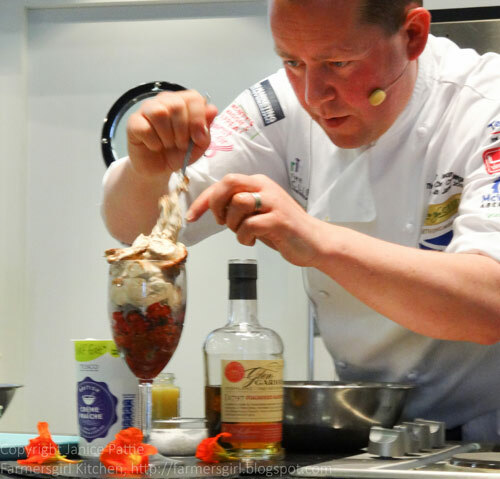 The main event, for me, was Craig Wilson, The Kilted Chef who is Chef Proprietor at Eat on the Green, Udny Green. 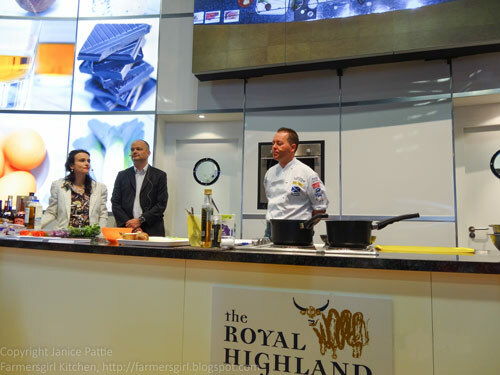 The theme of the demonstration was 'Science on a Plate' as Craig was accompanied by Nutritionist Alex Johnstone of the Rowett Institute of Nutrtition and Health at Aberdeen University and David Thomson, Head of Food and Drink for the Scottish Government. Craig cooked three dishes a Cullen Skink Risotto using finely diced potato rather than rice. Aberdeen Angus Beef with Vegetable and Chick Pea Bhuna and a Raspberry, Oat, Ginger and Chocolate Dessert. 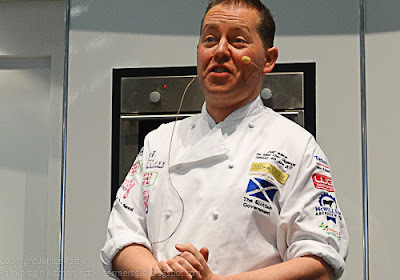 While he was cooking Alex told us about the nutritional benefits of cooking our own fresh ingredients. 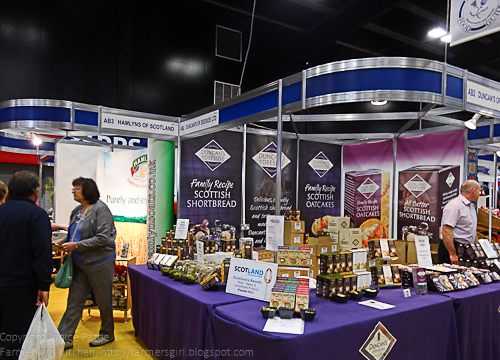 David was able to provide information about the Food Industry in Scotland, I learned that the Scottish Food Industry is worth £12.4 billion per year. I had a great time at the Royal Highland Show, there are still three days to go, so if you are able to get to Edinburgh, then I can thoroughly recommend it. If not, then start planning for 2014! 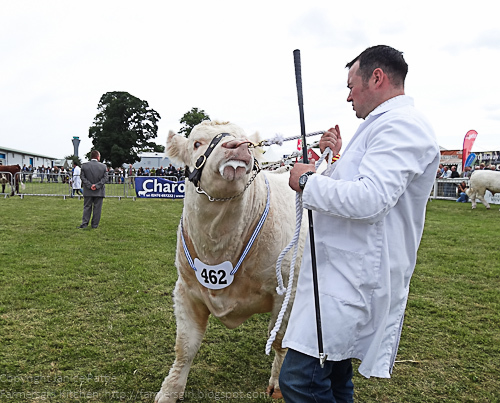 I'll leave you with some more livestock, without them there wouldn't be a show. Many thanks to Chris for inviting me to visit the Show. I received a complimentary ticket and parking pass for one day of the Royal Highland Show, I was not paid for this post and all views are my own. Looks like fun, better than that one we went to in Edinburgh. And... that explains why Claire hasn't replied to me email. She is off galavanting!! Sounds like a fabulous day Janice and you had good weather too. 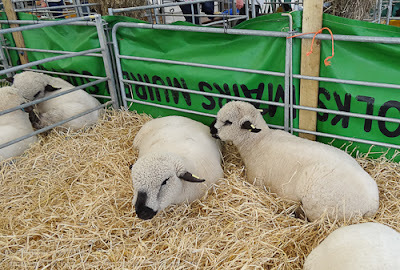 I keep thinking I ought to go to the Royal Cornwall Show as I haven't been for many a long year.